You can specify email notification settings for the protection group. If you enable notification settings, Veeam Backup & Replication will send a daily email report with protection group statistics to a specified email address. The report contains cumulative statistics for rescan job sessions performed for the protection group within the last 24-hour period. Email reports with protection group statistics will be sent if you configure global email notification settings in Veeam Backup & Replication. 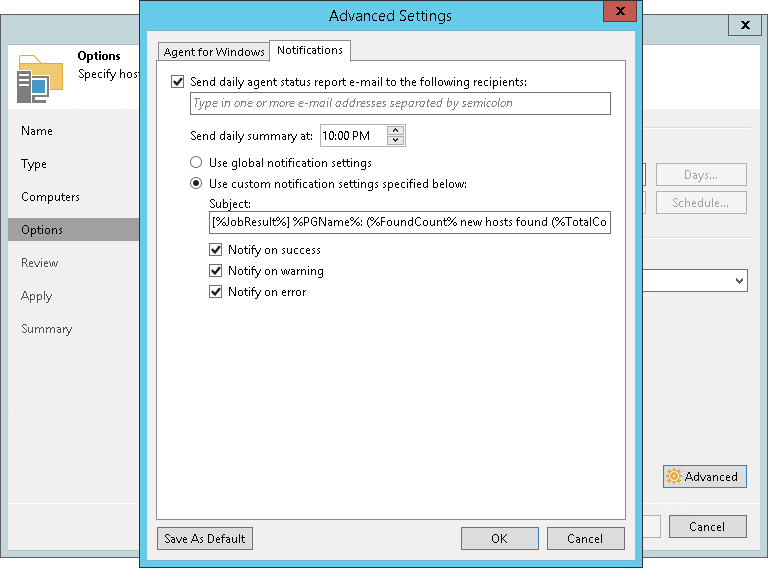 For more information, see the Configuring Global Email Notification Settings section in the Veeam Backup & Replication User Guide. After you enable notification settings for the protection group, Veeam Backup & Replication will send reports with the protection group statistics to email addresses specified in global email notification settings and email addresses specified in the protection group settings. Select the Send daily agent status report e-mail to the following recipients check box and specify a recipient’s email address. You can enter several addresses separated by a semicolon. In the Send at field, specify the time when Veeam Backup & Replication must send the daily email report for the protection group. To receive a typical notification for the protection group, select Use global notification settings. In this case, Veeam Backup & Replication will apply to the protection group global email notification settings specified for the backup server. %JobResult% — rescan job result. %PGName% — protection group name. %FoundCount% — number of new discovered computers discovered within the last 24-hour period. %TotalCount% — total number of computers in the protection group. %SeenCount% — number of computers in the protection group that were online for the last 24 hours. A computer is considered to be online if Veeam Backup & Replication successfully connected to this computer during the last rescan session. Select the Notify on success, Notify on warning and/or Notify on error check boxes to receive email notification if the protection group rescan job completes successfully, fails or completes with a warning.